Thread: Name this quilt block! A friend got these pieces at an auction and we are trying to figure out what quilt pattern these would go in to. The pieces are all triangular in shape. I at first thought just a plain ole triangle quilt but then I noticed if you tried to piece them together, some of the triangles would be upside down. I don't really think that there is such a thing as an 'upside down' triangle, unless the print it the fabric makes it so. I would just piece them in rows. Just lay them out and put them together like a jigsaw puzzle and see what you get. If we just piece them in a row, won't one block have the points going up and the next block have the point going down? My friend doesn't live near me so I cant physically get my hands on the blocks. I am a very visual person! Looks like it could be a pyramid. Go to Betsy Telfor-Goodwin's Rocky Mountain quilts. I saw a Roman Bar Pyramid that looks similar. they eventually square up. ​Might be Thousand Pyramid blocks? No clue, I would try to just put them together. Each of your triangle blocks consists of 9 triangles. 6 of them face one way, 3 face the other. Even within a block, some face up and some face down. You could put the blocks together all by themselves, or your could alternate your blocks with solid fabric triangles. It's like 1000 pyramids, but with the small triangles stitched into a larger triangle, those are often set off by a large triangle of similar color. They can be used for the individual triangles, or they could be used for the triangle blocks that you have. This search shows at least one with blocks similar to what you have. There is a different name for the variation that you have, but I don't remember off-hand what it is. I was thinking sugar bowl, but that doesn't seem to be it. I think I saw it recently in an historic quilt in a magazine, not necessarily the most recent magazine. 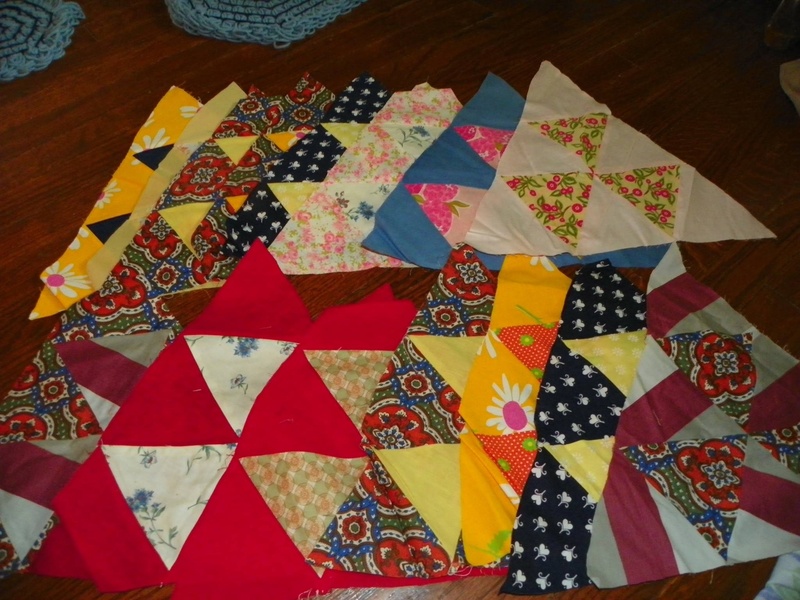 Why not use a large triangle of a solid color between the pieced ones and put the solid one upside down to make a row. Just a thought. It looks like the blocks with the solids on the inside should be turned upside down and alternated with the blocks that have the solids on the outside. Doesn't look like you have equal number of each type so you would have to make more blocks. I just googled "sugar loaf quilt" and that is the way it is put together. Pieced blocks alternating with solid blocks. You quilters never cease to amaze me. No matter what pattern is being search for, someone always finds it. I don't know how you do it. I have a hand pieced vintage top made with this block. they used muslim as same sized setting triangles. I love the top. Has old adorable old Aunt Grace prints mixed with others. It is very thin, so I have just draped it over old wicker corner shelves. Looks like some kind of pyramid quilt. When you get it all put together,it will be pretty! Go for it!! Name the block? How about "Hazardous Waste?" It looks exactly like the symbol for hazardous wastes in hospitals. Don't know pattern but if you put 6 together you can make a hexagon.